Italian summer pepper varieties still going strong. The wacky, way-above-normal-temperatures weather continues in my piedmont garden. We live in a frost pocket. Our yard gets zapped by frost when nearby neighbors remain un-iced. So when I tell you that my house — on November 4 — still hasn’t seen a speck of frost, that is testimony to the strangeness of this year’s “autumn” weather pattern. The weather forecasters have been promising cold any minute now for the last month or so. But every time a front approaches, it fizzles out, so that the cold air behind it never gets here. There’s talk of record snow in Siberia that will eventually mean deeply cold temperatures for much of the US, including my area, but I gather that weather is at least a month away. 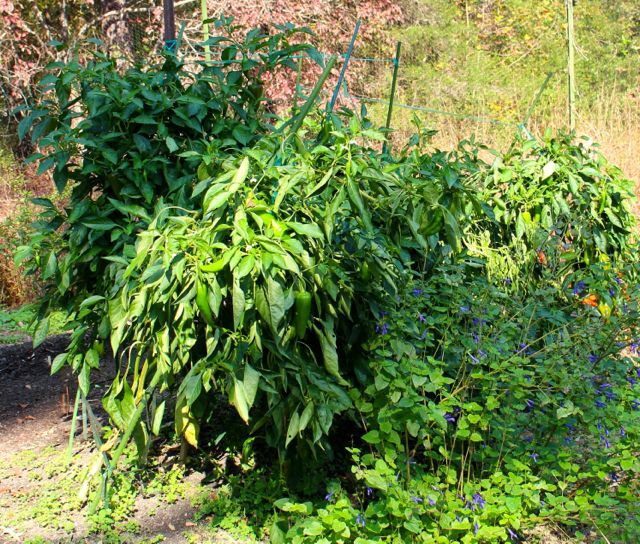 In the meantime, we continue to enjoy the best Italian sweet pepper crop we have ever grown. Pepper plants falling all over themselves. In normal years, my staking system for these peppers is entirely adequate. Usually they are long gone by early October, either due to drought or frost. 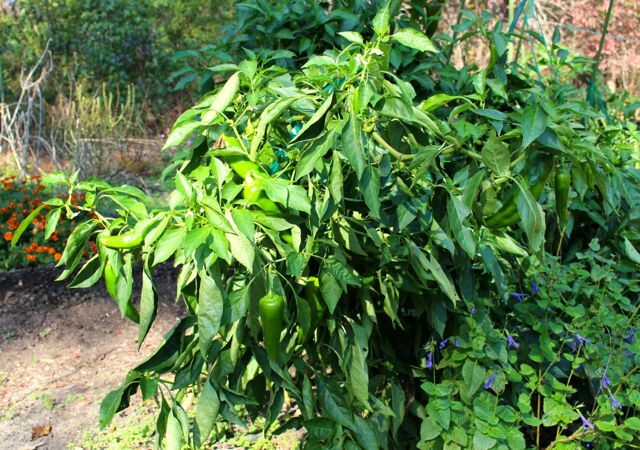 But this year, the peppers just keep growing, and flowering, and pushing out gorgeous large, heavy fruits that drag down overlong branches to the point where I’m having trouble finding the ripe fruits lurking deep inside this pepper forest. Those blue flowers bumping into the peppers are Blue Brazilian Sage (Salvia guarantica) — a very frost-sensitive perennial that is usually long gone by now. Four different pepper varieties are hopelessly tangled together at this point. No ripe fruits appear in these photos, because I had already picked them before I took these shots. I picked every ripe fruit I saw, because the forecast called for a nighttime low that usually translates to frost at my house. 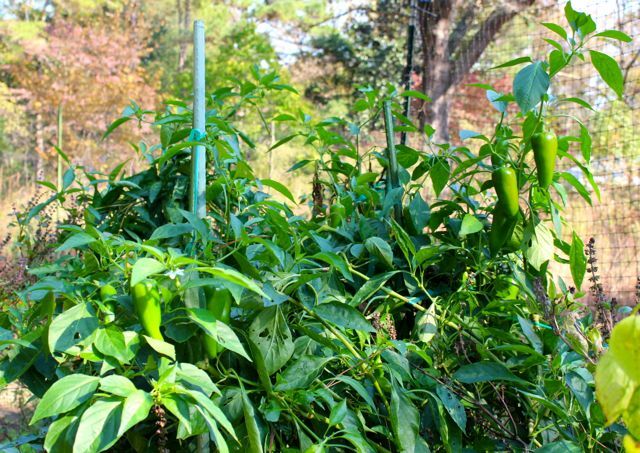 And peppers are very frost-sensitive. But the chill didn’t materialize, and today I picked a dozen more beautifully ripe fruits, some red, some yellow, all tasting of summer sunshine and vitamin C.
Wonder Spouse only just planted the garlic he ordered, because the soil thermometer warned us that the soil was too warm until just a few days ago. Yes, that’s a potato in the foreground of the shot. A tiny spud somehow eluded Wonder Spouse during last spring’s harvest, and he didn’t have the heart to pull up such a healthy-looking plant. 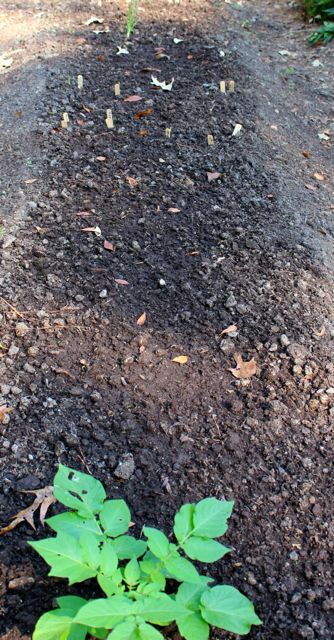 About six weeks ago, I direct-sowed all the remaining seeds of the greens I had planted for this past spring’s crop. I sowed thickly, because the seeds of lettuce and other greens are not supposed to keep well. Mine had been sitting in a box in my study, so I guess the air-conditioned house kept them happier than I realized. I think I got 100% germination from all varieties, including the carrots. I thinned as much as I could, moving seedlings to adjacent beds. But eventually I ran out of room. And enthusiasm. 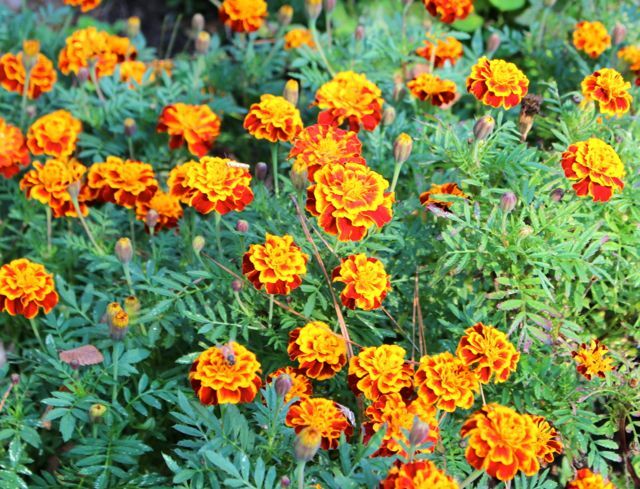 Those are Queen Sophia marigolds in the foreground of the shot of the second big greens bed. They’re usually done for the season by now too. Not this year. I couldn’t bear to pull them up to make room for more greens. They were there first, after all. Protected from the frost that refuses to materialize. 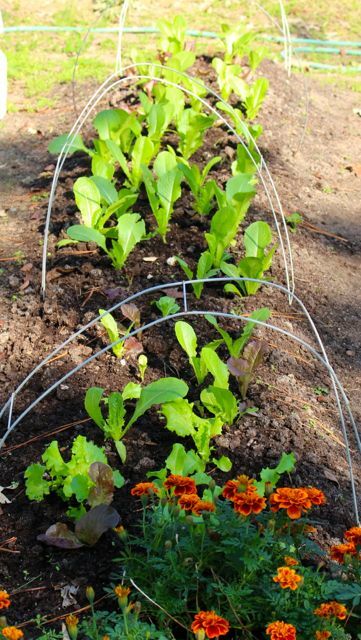 A couple of days ago, the weather forecasters began speaking excitedly of the imminent arrival of seasonal autumn temperatures, so I broke out my row covers and covered the salad greens. The big tent on the left is protecting broccoli. However, the crop is not happy; I think it’s just been too hot for the plants to thrive. Of course, now the forecasters have raised the predicted nighttime lows to temperatures well above freezing. But the weather is at least cooler now. The row covers will probably just encourage the lettuces, spinaches, carrots, beets, and dill to grow a little faster, meaning more fresh salads. We aren’t complaining. 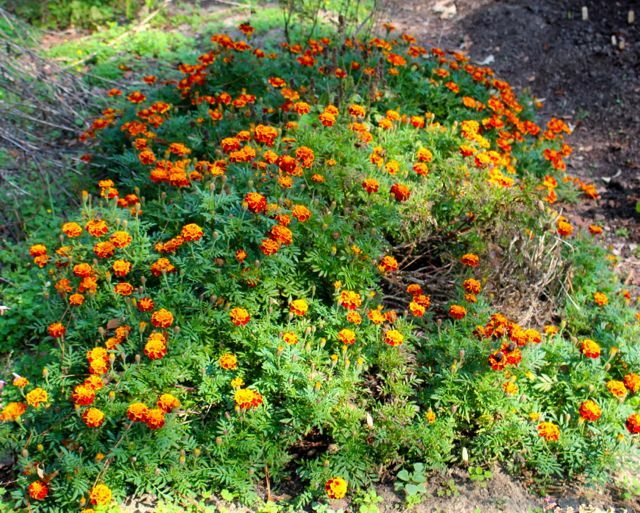 Queen Sophia marigolds own otherwise empty summer beds. The marigolds I tucked in beside squashes, tomatoes, beans, etc. months ago have grown to epoch dimensions, spreading out as dead summer crops were pulled out of their way. Local bees — and the few stray butterflies still flitting about — are delighted the Queen Sophias continue to reign with enthusiasm. A closer look at the Queen Sophias. What a strange autumn. We had almost no fall color, because the nighttime temperatures were too warm. A cold front that blew in today denuded many of the canopy giants in my yard. Yet summer peppers, salad greens, and sunny marigolds continue to thrive. That’s why I’m still gardening after more than 50 years of playing in the dirt. Every year — and every season — is different. 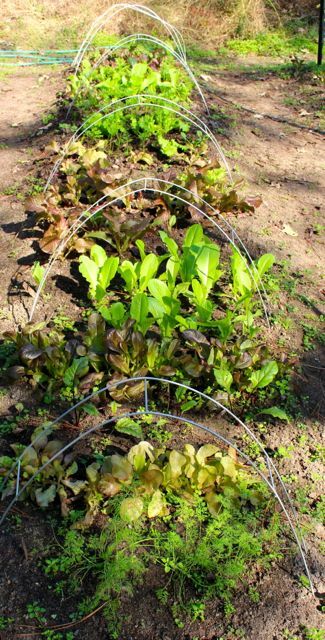 This entry was posted on November 4, 2016, 8:25 pm and is filed under piedmont gardening, Vegetable Gardening. You can follow any responses to this entry through RSS 2.0. You can skip to the end and leave a response. Pinging is currently not allowed.